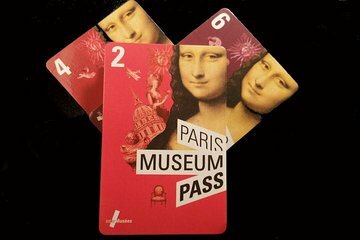 Nyt problemfri besøk til noen av de beste museene og monumentene i større Paris med et 2, 4 eller 6-dagers Paris Museum Pass. Hopp over de lange inngangslinjene ved Louvre og Versailles, og opplev de utrolige samlingene av Musée Rodin og Musée d'Orsay gratis ved å bare vise kortet ditt. Passet blir beleilig levert til hotellet, noe som betyr at du kan begynne å oppdage mer enn 50 av byens kunstneriske underverk og monumenter, som Les Invalides-der Napoleon er begravet - umiddelbart ved ankomst. So happy we prepaid the three day museum pass. It was delivered to our hotel with no delay. We picked it up and we’re on our way. We got right in to museums without the Long wait. This is a good idea, but it's hard to get your money's worth from this kind of pass. We spent too much time in The Louvre and ran out of time for everything else. I would recommend selecting a few places you have to see and then pay for each individual place. Always a must when you travel to Paris. It delivered on time, and allowed me to skip the line at the Louvre. Gets you into almost all of the important museums. Impossible to see everything on the two day pass. Only problem was Versaille. No skip the line and the wait was over an hour to get in. Don't go there mid-day. When we left at about 3:30 there was no line to get in. Great value for the money. I can't tell you how many times we walked right into museums and places where there were lines. Take advantage of this and make sure you get to all the museums and not just one or two. ... allows the pass holders to skip the various lines and to take advantage of getting a head start. The hotel delivery option is very convenient. This is the best way to save money, avoid lines and see a myriad of museums including The Louve, Musee D'Orsay and the Arc dTriumph. The deliver the tickets to your hotel and the start date is the first day that you use the pass. They include some maps and lists of things to do in Paris. Having it delivered to the hotel was really worth it. On our first day in Paris we did not want to find Galeries de Lafayette to pick up the pass. There is no point to trying to skip the line because you have to go through the Security line first so the ticket line just continued. It was convenient to have the pass so we did not have to buy a ticket but we never got our money's worth. Tickets were about 9 Euros and we only could do one at most two museums in a day so in 4 days I went to three museums. As long as you go early like 10 AM the crowds were not so big and we went to less crowded galleries in the Louvre.